I truly believe that there is no better city in the world than London in the summer time. The warm days and long light evenings just seem to bring the capital to life. Now there are some downsides, the packed sweaty underground train and the noise from the ever increasing traffic. But if you look hard enough you can find some real oasis of calm where you can relax, grab a nice cold drink, and eat some great food. I was lucky enough to do an event last week in a vineyard in Kent. While we were there, we did a tasting under an old oak tree in the middle of the vineyard. Now, what struck me, other than the amazing view across Romney Marsh, was the total silence, no phones ringing and no traffic noise just pure silence. The next day when I was discussing this with a friend who lives in London, they told me the only place in London they can do this is the middle of Richmond Park! Now, I am not saying let’s all go and sit in the middle of Richmond Park, but within the centre of London there are some amazing green spaces. My personal favourite is St James Park. You can’t be more central with amazing views of Buckingham Palace, the London Eye and Horse Guards Parade. Just throw down a mat, put a cold drink in your hand, eat some of your favourite food, and simply watch the world go by. There are other great green spaces in London. I love walking around the Serpentine in Hyde Park and if you are brave enough, you can even take a dip in the water to cool down. Regents Park is stunning and can offer pretty much everything from taking a boat on the lake, to walking round the Zoo. 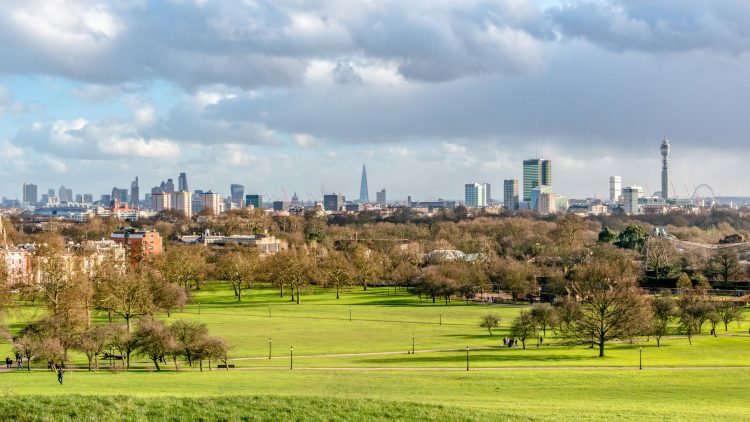 But the best place is at the top of the Park near Primrose Hill, this gives some of the best views across London. My ideal picnic food would be a homemade sausage roll (everyone knows I love a sausage roll) or a lovely pork pie from the Ginger Pig and for something sweet it would have to be a Eccles cake from St John and a piece of Godminster cheddar. My drink of choice would be a nice cold Camden Hells or a long Vodka and tonic and just putting this out there but, I do love a Mojito!!!! If sitting in a park is not your thing and you prefer to have your food and drinks served to you, whilst still making the most of the sunshine, London has some great roof top bars. If you have some spare cash you might like to try the Radio roof top bar on the top of the ME hotel in Temple, lovely comfortable seats with great views across London, but you will need to book. Sushi Samba is at the top of the Heron Tower and has probably the highest roof top bar in London with stunning views, serves great cocktails and sushi at a healthy price, but it gets really packed by city workers. The lift ride to the top is not for the feint hearted or for those scared of heights, but well worth it to soak in the view. There are other bars that offer great outside drinking and eating without the price tag. Franks Café in Peckham has been going for a few years now and only runs in the summer months, it is situated on the top of a multi-storey car park, grab a drink and listen to some great tunes and watch the sun go down. The Culpepper pub is in Commercial Street and has a small roof garden where you can grab a drink and a bite to eat. The great thing about this pub is that they grow a lot of their veg and herbs on the roof garden so you can almost guess what will be on the menu by what is growing around you. Summertime is festival time, now I am not talking music festivals but food and drink festivals. Over the last couple of years more and more food festivals have been popping up, Taste of London has led the way for a long time, but some feel that this has become quite expensive and out of a lot of peoples reach, so I have picked out a few that will appeal to all budgets. Have a great summer and enjoy the best of what London has to offer.